Producing healthy soil, forage and lambs were only the initial challenges. Sending our lambs off on a trailer to a commodity auction site and strange, crowded conditions didn’t match our vision of quality of life from birth to death for our flock. Slaughter and processing capacity is generally the step that stops small producers from direct marketing meats. Meat marketing is more complex than the marketing of produce, eggs or baked goods and there tends to be few inspected slaughter facilities that have the interest in working with small producers. Even when a facility is willing to accept lambs and goats their equipment is likely to be inadequate. Sheep and goats are significantly smaller than cattle and the handling equipment needs to be adapted to ensure safe and stress free flow. When the chutes and holding areas are too large sheep and goats tend to pack in corners, attempt to jump over each other or squeeze through any gap. Larry began researching a mobile slaughter and processing trailer. 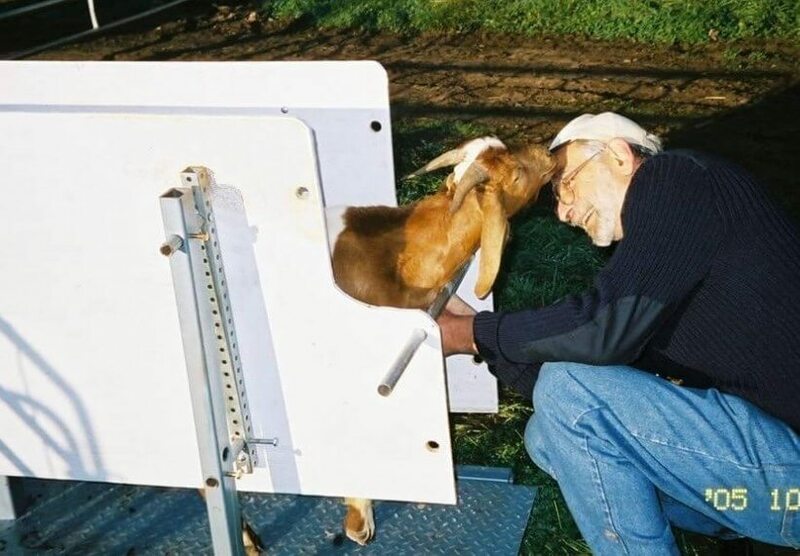 In 2005 he received a Sustainable Agriculture, Research and Education (SARE) grant, Design and Pilot a State Approved Slaughter Trailer, to pilot his ideas. On this project we had the opportunity to work with Joe Regenstein, Ph.D., Cornell University and his collaborator Temple Grandin, Ph.D., Colorado State University, an internationally renowned livestock facility designer. Both are actively involved in the development of humane animal handling systems and guidelines. We found the amount of time and resources necessary to start-up and manage a facility, even a small portable unit, would distract from our availability to care for animals. There is just so many hours in the day. For more information on the results of this project see our Spirit of Humane website. We struggled for three years on resolving the slaughter challenges. With Dr Regenstein’s consultation and support we evaluated and ran trials at 5 facilities ranging between 80 to 400 miles from our farm. During this process Larry perfected slaughter and butchering techniques appropriate for lambs and goats. 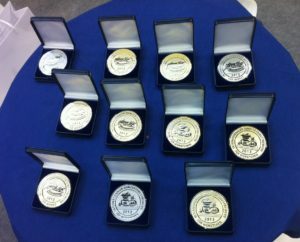 Olson’s Woodville Meats, only US company to win at the 2013 IFFA International Quality Meat Competition–including a gold for Shepherd Song’s summer sausage. A “very small” state facility contacted us interested in upgrading to USDA inspection. We invested labor and finances to support their goal. Six months after this facility received USDA licensure another “small” Wisconsin State facility was licensed by USDA. Both, coincidentally, were within 20 miles of our farm and both were willing to allow us full control of the slaughter and cut-up processes. This means that we are able to control the process without dealing with the all the issues of owning and managing a slaughter and processing facility. Our lambs and goats are delivered by Larry or another farm caretaker, and are not hurried, stressed or abandoned in a strange place. Larry has developed the expertise to work on the floor during slaughter and cut-up and is there without exception. Olson’s Woodville Meats, only US company to win at the 2013 IFFA International Quality Meat Competition. Including a gold metal for Shepherd Song’s summer sausage. 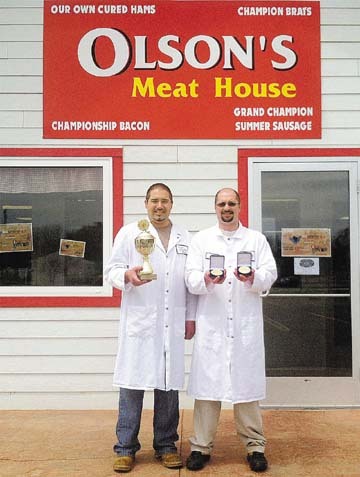 Kevin and Cory Olson, third generation butchers, of Olson’s Woodville Meats have won 9 gold medals, 3 silver medals, and the Ehrenpokal Trophy for their custom meat, sausages, and ham at 2013 IFFA Convention in Frankfort, Germany on May 4-9, 2013.